Tonight, when many European teams play their international friendlies to prepare to UEFA Euro 2016, we begin out countdown to the UEFA tournament. We begin with Stade de Nice or, as it’s known on a regular basis, Allianz Riviera. 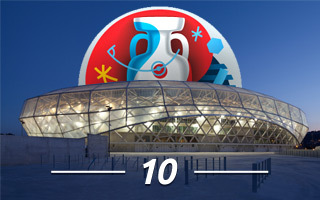 We’ll end on June 10, when France kicks off at the magnificent Stade de France. For now, welcome to Nice! OGC Nice had been playing at the aging Stade du Ray for years when the first proposal for new stadium surfaced in 2002. Despite several attempts and numerous promises, efforts to build the venue proved futile until France won the rights to host Euro 2016. In 2009 a design competition was launched, resulting in the new stadium finally getting built. Since it’s a brand new stadium catalysed by the event, we include all of its cost into the tournament preparations. Initially estimated at €200 million, the building ended with a €245 million price tag, as established when the construction deal was reached. This means it’s the most expensive stadium of Euro 2016 when compared to capacity and/or population of the city. Public contributions came from three sides. The state submitted €18 million, the region followed with €20 million, while the remainder rested on the city of Nice. Municipal authorities reached an agreement with the Vinci group, along which the private developer built and will operate the stadium for 26 years, receiving over €8 million per annum from the city. Interestingly, additional cost surfaced in 2015, when decision was made to replace all 35,000+ seats due to their low durability. While the old Stade du Ray stands in the historical part of Nice, the site for new one was selected in far less occupied area 12km west of the centre. In the picturesque valley of river Var the stadium lies beside a major highway hub and within close proximity to the international airport. Designed by the famous Jean-Michel Wilmotte, the stadium was part of Nice’s pro-ecologic efforts and this is clearly seen in the design. Simple, neutral in colour and focused on using natural resources in a sustainable manner. For the first time among stadia of this size, the roof is partly based on a wooden skeleton encompassing both the stands and roof. The structure can be clearly seen through the translucent ETFE façade, shaped in an almost fluent, vivid outer form. The roof is covered partly by photovoltaic panels, spanning across 7,000 square meters and producing enough electricity to power 600 households every year. The stadium was built with a fixed capacity of 36,178 seats, reduced to some 35,000 for Euro 2016. Though the capacity doesn’t require it, the seating bowl was divided into three tiers. This on one hand allowed the creation of extensive premium zones across the stadium, on the other made the stadium more compact. And finally it also means it’s easier to reduce capacity when the uppermost tier is not needed. Long-term operation of the stadium is secured thanks to OGC Nice’s tenancy. In their first season at the stadium, the club enjoyed an impressive average attendance of 24,186 people, though the crowds have decreased before Euro 2016 (19,192 per game in 2015/16). The stadium is among the best throughout France’s southern coast, a huge tourist hub. That’s why it was also planned as a concert site for up to 45,000 people, especially in the summer season. It also meets all requirements of professional rugby. Additionally, the stadium hosts the museum of French sport and has a retail precinct adjoining it on the east side, providing visitors every day.